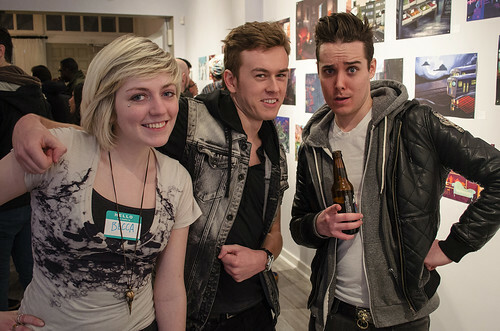 LIGHT GREY ART LAB: Great Personality : Recap and Photos! Great Personality : Recap and Photos! 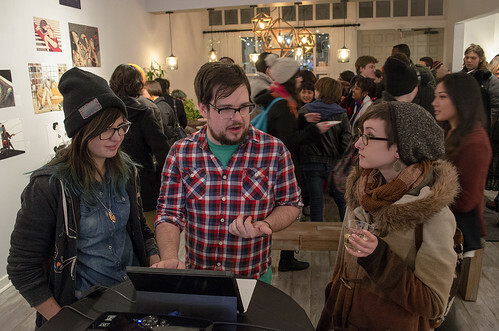 Gathering around the tablets for a big-screen experience! 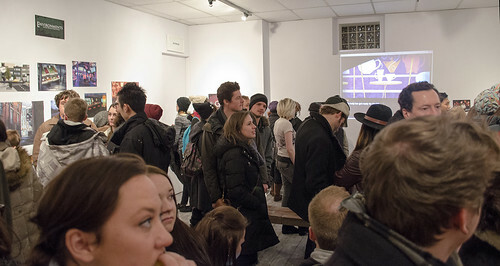 Huge thanks to everyone that came out and partied with us at the Great Personality Opening Reception! We had quite a few people playing the games, laughing (and blushing!) and really getting into meeting the the characters and exploring the space! This has really been one of the most interesting experiences -- from creating the game, to making a world... to just getting the chance to talk with people about the whole experience! We were furiously coding up until the last minute -- as all great creative projects go (right!?). 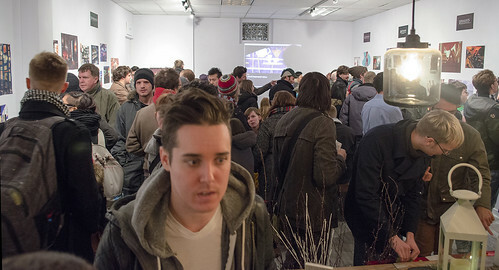 And once we opened the doors, a flood of people joined us for an incredibly successful opening! We had the pleasure of having guest artist Sam Wolfe Connelly join us for an artist lecture that night -- and the whole lot of us ran around, finding our types, and getting into the zone! Giant thanks to David Washington for helping us get some tablets for the whole experience -- and thanks to all of the wonderful people that checked in with us ONLINE! If you haven't had a chance to see what the buzz is about, we created the first of four dating sims based on the Myers Briggs Personality Types. The first story features you, a new resident in a strange city -- as you meet new people, find your way around, and have some friendly - to - sensual (!) adventures! The whole story ranges from some PG - to PG-13 moments, and for all of you dating sim-lovers out there, we have built in some really fun alternate endings, and some really funny encounters. The whole game allows you to make choices, and the choices you make will determine how compatible you are with each of the characters --- and ultimately let you see how it all plays out to your advantage - or not-so-advantage! You can download the game HERE for free, and if you feel so generous, you can help us spread the word! We'd love for everyone to play it!! I had a blast coding the project and working with all of the amazing artwork. It really has been a surreal experience. The spaces and people that were created for this project were incredible, and the stories practically wrote themselves. I owe a huge thanks to all of the creative people that put their time and effort into this project to make it a reality. Anyway, I'd love any comments or thoughts about the game, the project, or otherwise! We really love talking with people about how it went, what they thought, and what they'd like to see from us in the future. And I totally encourage you guys to take a look at the Flickr set where you can see the great turn-out, --- AND OF COURSE, stay tuned for the next three games (which will be coming out soon!). In these games you'll get to see more of the world, get to know some other amazing characters, have some crazy encounters and gain more of your bearings in the city while you watch the whole world unfold.